Specialized in UX design, the Uni agency supports companies in the luxury sector in the design of their digital platforms, website, mobile application, web app, SAAS software. Located in Paris, Uni specializes in web design and interaction design. With its experience and know-how in artistic direction, the agency creates intuitive and efficient interfaces. We pay particular attention to the aesthetic aspect of our creations: our graphic universe mixes luxury conventions with the latest trends to get the best out of them. Oriented Mobile First, UI Design Uni agency ensures optimal rendering for all screens, adapted to the identity and personality of your company. Our approach is based on UX Design, a user-centric creation process. Research: analysis of your needs, competitive benchmark, estimate. Strategy: goal setting, UX co-creation workshop, user research. Design: user journey, models, interactive prototypes. Delivery: collaboration with developers, monitoring, analysis of results. Collaborative, the design agency Uni works with tools like Invision that allow you to follow the progress of your project continuously, for websites or mobile apps. 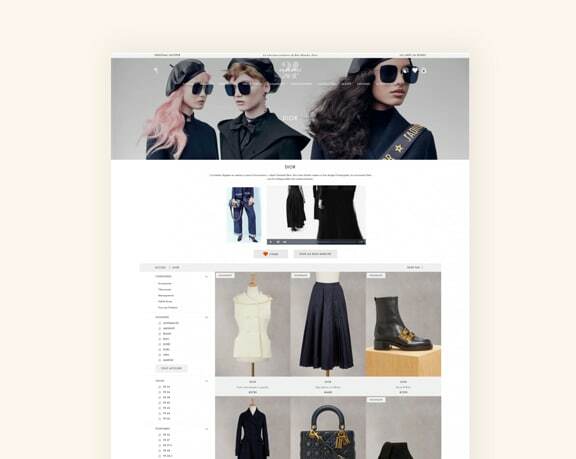 The Digital Agency Uni signs the new online shopping and luxury platform of 24 Sèvres, a subsidiary brand of the LVMH group. Uni is a digital communications agency specialized in luxury, which combines different know-how in digital strategy, artistic direction, UX design and UI design. With its experience in high-end luxury, the agency has collaborated since its creation with many international brands, such as: LVMH, Alain Ducasse, the Cheap, or more recently, Charles Jourdan.